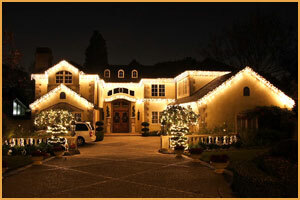 Specializing in christmas light installation, Sacramento Holiday Lighting If a beautiful, professional display is what you're after, we can create something that will have the neighbors in awe! The goal of our decorating is to "light up" the buildings and trees on your property in a visible display of holiday spirit. This is achieved by outlining the shape of the rooflines and windows, as well as draping or wrapping a tree with lights to accentuate its natural shape. We design in a very tasteful way to maintain the element of elegance you're after. We also offer many custom lighting products and light animation. 1-877-XMAS-GUY Has Been installing Christmas Lights in Sacramento for over 12 years.